Like most people, I watched the unfolding horror last night with a heavy heart and tears in my eyes. Sometimes, I utterly despair of humanity but then I am also heartened by the outpouring of compassion, the queues of people lining up to give blood in Paris and the #PorteOuverte hashtag that sprang up where people opened their homes to anyone stranded in the wake of the attacks. As charts began to appear on Facebook, I decided to begin looking at the astrology. Whilst my soul cries out at such an abhorrent act, my mind seeks to try to understand on a cosmic scale what is going on. 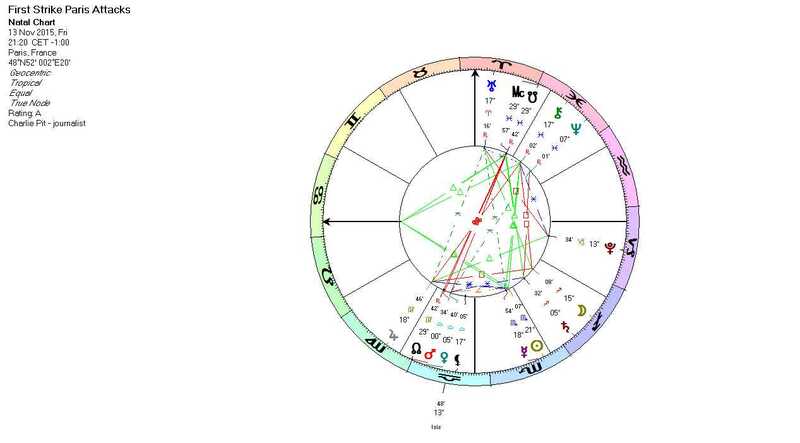 This ‘first strike’ chart is immediately ominous with the anaretic South Node conjunct the Midheaven. Any planet or point on an anaretic degree is considered unstable and the South Node can represent vulnerability as I mentioned in my post on the Nodes shifting signs. This conjunction takes place in the house of international communications, foreign affairs, travel and religion. Angles are uniquely sensitive points in astrology. The Moon (representing the people) is in Sagittarius also associated with foreign affairs/religion and the sign connected to the 9th house in a natural chart. The 5th house is connected to fun, pastimes and sports. Most of the victims were enjoying some downtime at bars and restaurants and at a gig at the Bataclan concert venue, all fitting 5th house energies. Explosions also occurred at the football stadium where there was a friendly match going on between France and Germany. The Moon forms the apex of a t-square with squares to Jupiter opposite Chiron. So we have mass (Jupiter) injuries (Chiron) to the people out enjoying themselves (Moon in the 5th house in Sagittarius). Jupiter disposits the Moon. Jupiter opposite Chiron also can be read as representing the wounds (Chiron) caused by religious (Jupiter) divides (opposition). Chiron is also the scapegoat and already there are heated discussions in social media pouring blame on innocent parties such as those following the Muslim faith. Mars is conjunct the North Node and notably opposite the last lunar eclipse degree which was at 4 Aries. Mars tends to activate eclipses. Mars conjunct the North Node is active – Mars is action/aggression/defence/violence and it’s on homeground as Mars is conjunct the IC (the root of the chart). Generally speaking, planets conjunct the North Node are considered ‘positive’ but in this case perhaps the lunar eclipse energy meant that this point became unstable. Another way to look at this is that this is an important marker in our karmic history as a race. What we do (Mars) now affects our future karma (the North Node). I have to say that when I read this, I immediately had an image in my mind of the ‘willful’ attackers, ‘overshadowed’ by their warped faith. However, we can also read this more simply in that the Sabian speaks of something being ‘overshadowed by a superior power’. There are other more positive ways to read this Sabian of course but in this case, the symbolism is literal. Whilst the attackers aren’t ‘superior’ in any humane sense of the word, sadly, on this occasion, they did have the upper hand which was the element of surprise. 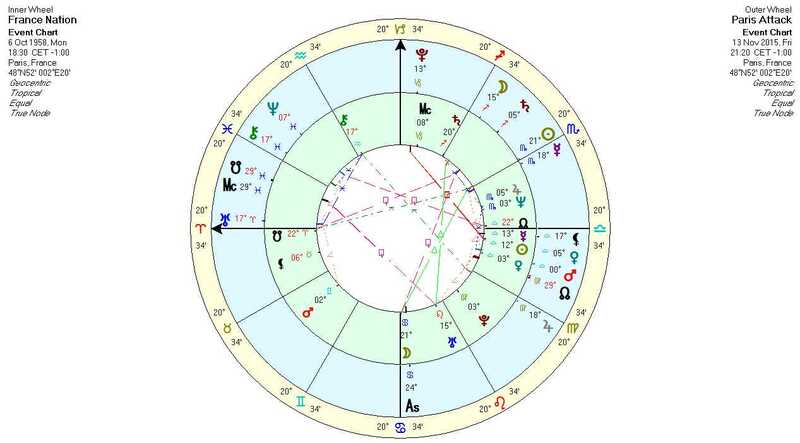 Putting this chart around the chart of France as a bi-wheel, the chilling nature of the Ascendant Sabian becomes even more apparent as it is conjunct the Moon in the national chart – the Moon again indicates the people of France, the public. So in this case, the people are ‘overshadowed’. The element of ‘surprise’ is clearly shown by transiting Uranus in the 12th house (rebels, shocks and hidden enemies) conjunct the Ascendant of the chart of France. Uranus is currently retrograde but I would suggest that it may be important to watch for developments in April next year when Uranus will cross the Ascendant of France for the 1st time in a series of three conjunctions. Given the close proximity to the South Node in the national chart, there may be further difficulties as Uranus crosses over and stations on this point. Also, Uranus will square the Moon in the national chart which also produces stress on the people. France may take on a very different persona as a whole and may possibly lead the way in making big changes but this is not without stress as a square contains tension. Squares however insist that action is taken so I anticipate France will be proactive in bringing reforms in an effort to protect its people. Note too that Uranus forms the apex of a Finger of God or Yod pattern in the First Strike chart. The Yod is completed by Jupiter and Mercury at the base. Yods have a sense of insecurity about them – a damned if you do, damned if you don’t kind of feel to them. The Yod has the potential to provide understanding with Mercury sextile Jupiter that brings a fresh perspective (Uranus), but it isn’t without strain. The unease is palpable. I note that the last Solar eclipse was almost exactly on the 6th house cusp of the chart of France although actually in the 5th house by just a few minutes. In mundane astrology, the 5th house rules places such as theatres, sports and entertainments so like the first attack chart, we have another confirmation of something unseen/unexpected (the eclipse) happening in areas connected to recreation. Note that Jupiter from the First Strike chart falls in the 5th house of the national chart – yet another reiteration of the places of entertainment which were targeted. The Moon (the Public), already under duress as the apex of a t-square falls in the national 8th house – the house of death/public mortality/public death rate in mundane astrology. Isil, previously known as Isis has taken responsibility for the attacks. Whilst the asteroid Isis certainly has different meanings in natal astrology, asteroids do have a knack of manifesting their energies in very literal ways sometimes. In this case, asteroid Isis in the First Strike chart is exactly conjunct France’s Mercury and conjunct the nations Sun. An eyewitness said that one of the attackers said that this was a message (Mercury) to President Holland (the Sun). These terrible attacks took place as the North Node moved into Virgo, representing a karmic shift for all of us. I mentioned that as the corresponding South Node moved into Pisces, we need to stop dreaming and start doing. I saw a quote on Facebook earlier ‘Peace begins with the next person you meet‘. ‘Alice’ (Lena Gwawr) via Alice in Wonderland’s Teatray. There are many prayers being said for France, for the dead, for all those affected. I am taking part in a mass prayer for the whole of humanity tomorrow evening at 6pm London/Lisbon time because I do believe prayer and positive, heartfelt intention helps. But if we really want change in the world, each of us must look to the details of our own lives, to resolve our own conflicts, to deal with our own inner demons, to shake off our fears of the unknown. The politics surrounding who did what to whom and why is mind-boggling and outside of those secretive chambers we may never know the entire truth of what is really going on. With the South Node entering Pisces, it is too easy to despair but our collective task is not to give in but instead pick up the pieces and make this a better world. The MC and South Node are conjunct the eclipse degree of March 20, 2015. 29 degrees and 27 minutes. Thanks Mary – yes, that eclipse degree was also activated too. It does make me think that some eclipse degrees perhaps remain in effect for longer. Why wasn’t this predicted before it happened? ‘A willful man overshadowed by a descent of superior power’ – can’t we simply interpret the former as the attackers and the latter as the strong opposition that was set in motion, on a larger spiritual level? Yes we could indeed interpret it like that. There are many ways of interpreting the Sabians. AstrologyBoy – Sorry for the delayed response. Prediction of all kinds is balanced with free will. Up until the last minute, the people that did these horrendous act had the free will to choose not to take part. 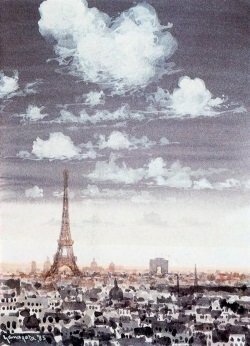 The future is not set in stone but we do have certain cycles that suggest certain types of events – for example generally we can say France is going through very powerful changes and upsets with Uranus crossing the Asc. If you look back to articles by astrologers on the Uranus-Pluto square, you will see a lot of talk about world changing events occurring. It’s similar with Saturn entering Sagittarius where I talked about how Saturn closes down borders. Astrology for me is less about predicting, more about understanding cycles and how we can work with them. If you’re interested in seeing how astrology is connected to world events, you might like a book by Rick Tarnis called Cosmos and Psyche. There’s a movie being made of this book as well. Thanks for your comment. It’s not something I can look into at the moment unfortunately as I am very busy with client work however I certainly hope the event goes well without any problems.